"The Happiest Place on Earth." This is the tagline for Disneyland, and for many, it can be true. Smiling children. Fun adventure. Nonstop candy. Rides galore for all ages and interests. Fireworks lighting up the night. Drama, music, dance. And souvenirs! They were expecting us. This was, quite possibly, the most amazing welcome anyone in our group of 23 sojourners had ever received. Over 150 people, mostly small children, waiting for us with posters, balloons and fanfare as our bus pulled into the end of the long dirt driveway. Music played, commotion everywhere! Celebration abounded. We felt like celebrities, even though we were all just a bunch of ordinary people. I’d come here with my then 11-year-old son on a short-term missions trip with our church. 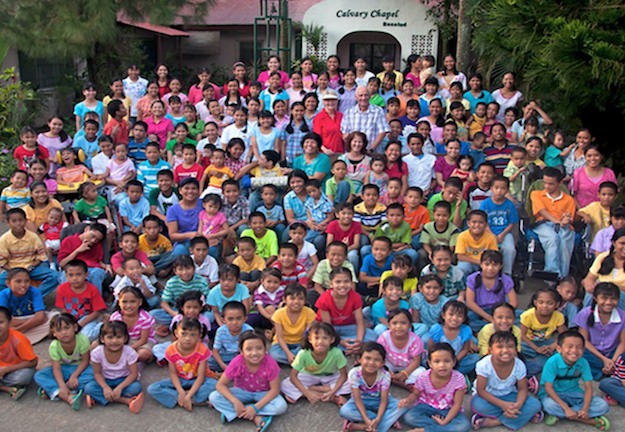 This is the R. family – Ben (Tata) and Diane (Nana) and their 150+ children! Retired military but also a soft-hearted man of God, Ben offers just the right combination of leadership, discipline, joy and warmth to fill the place with nothing less than contagious energy, charisma and purpose. This couple responded to the call years ago to begin an orphanage in this Filipino city of half a million people. Only, it didn’t turn out quite as they thought. Over time, they had people literally giving them their children to raise. This was the case even when one or both parents were alive, not to mention when children were truly orphans with no extended family to care for them. After prayer and much investigation, they realized that adopting one…then five…then 10…and then 25 of the children was the better path to follow. So they did. You might think that Ben and his wife Diane must be superheroes. I mean, really – how can anyone care for and raise children in such huge numbers and keep going for so many years? This is a case where, “With man, it is impossible, but with God, all things are possible,” to quote Jesus, the most influential man who ever walked our earth (Mark 10:27). 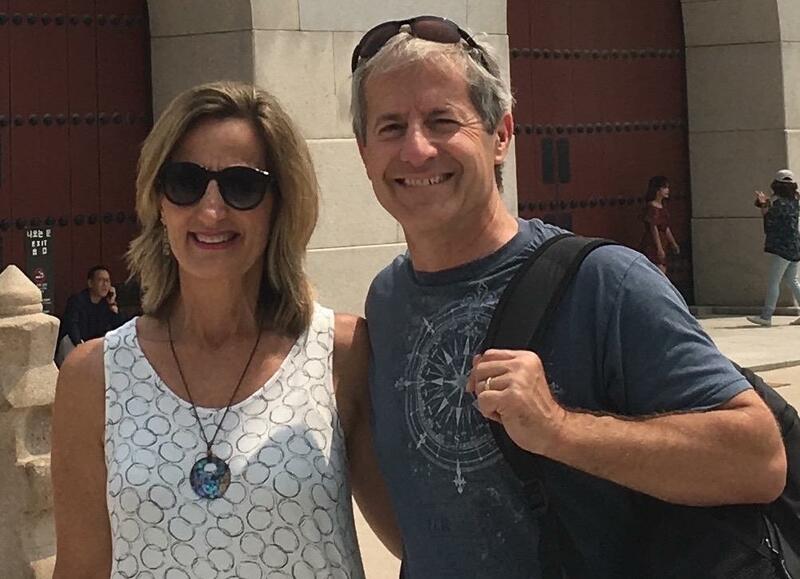 Ben and Diane are truly people of the Book; they live, breathe and walk their faith so fully. It’s inspirational. But, exactly, what is this "happiest place" they created? It’s a home for approximately 150 children, from infants to 18 year olds, as well as a host of “graduates” who help, at any one time. Some are special needs, but they are given dignity and a place in the family as much as any other child. It is also a school, a farm, a training ground, a small business. And, most significantly, a church – a holy place of worship and play. The home itself is magical. Everywhere you go, there is art, there is Scripture, there is song, there is beauty. The children attend school in one of the four classrooms, taught by some of the “graduates” of the R. household. The children also learn how to work in the garden and the field, with animals, and make different types of handicrafts for sale. They all have jobs in teams. Disciplined work is part of the training. A crew of 10 to 12- year-old boys is on cooking detail tonight, along with a few of the regular cooks. Another crew of 7 to 9-year-old girls is on meal set up, while the 7 to 9-year-old boys are on clean up. Some of the older children attend to the special-needs children to help them feel more as if they are more specially wanted in the family. Little ones keep us entertained. Their smiling faces light up the eating hall. The meal is simple, but nutritious and delicious. There is order amidst the chaos. Although we are weary from a day of travel, the food gives us a spike in energy, just what we need for the evening welcome program. What a treat! This group sings, dances, recites poetry and Scripture, acts and enthralls us all! At this "happiest place," no one is left out. They fill the stage at the end, and invite us to come up and dance with them. They generously welcome us with the very best they have to offer; our hearts melt. And somehow, they have managed to squeeze all 23 of us into their home that evening. I am sleeping in a bed of a little girl named Blessy. It’s a room of five bunk beds and two regular twins, and the twelve of us women fill it completely. It seems like the girls may be 5–6 years old. I make a note to search for Blessy tomorrow, though I’m not sure how I’ll find her. But I know that she has certainly blessed me with a place to lay my tired head! Don’t mistake me. The R. home is not without sorrow or pain, disappointment or disobedience. They have experienced hardship and challenge. But Ben and Diane have raised these children – along with a number of others who provide much-needed help – to know and trust Jesus as their friend and Savior. They have raised them with hope. We have kept in touch with the R.’s and hear from them regularly. In fact, we had another opportunity to revisit this “happiest place on earth” – where lives are transformed and joy is the operative word – in 2010 during our yearlong stay in China. We remain continually impressed by the incredible way they live and walk by faith. What is your “happiest place on earth?” Where have you felt most alive, most connected, most delighted – and why?